Just like for any other business, you must define a clear value proposition for your online or digital business before starting one. Anyone who is unable to articulate clear statements about what it’s business stands for and what it aims to achieve will always struggle through the various stages of business growth and won’t be around for too long. A number of online entrepreneurs fall into this trap by jumping in to work on their new passions of working online without taking the time to define their value proposition first. 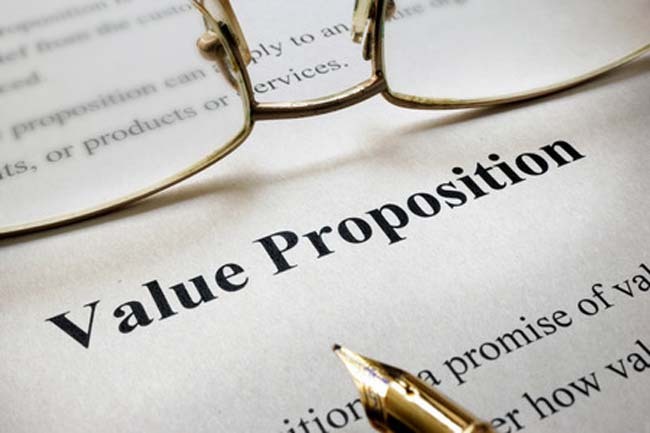 This article and tutorial reviews the basics of a business value proposition. What is a business value proposition? A business value proposition is a marketing statement which promises value to the customer and specifies the unique quality and benefits of the product or service offered. It is a short statement which is used by companies to target those customers who are supposed to benefit the most from using the products or services of the company. This statement is prominently displayed on the company’s website or other digital platforms. Why is having a good business value proposition important? It provides the foundation for your business growth efforts – A good value proposition addresses the key elements of starting and growing any business – whether online, digital or other. Defining it makes the process of business growth quite simple and straightforward. It is a marketing tool- A value proposition states the reason why a prospective customer should buy from you. It is the most important marketing tool which can help you to secure more customers. You can state your company’s objective and it’s Unique Selling Proposition by mentioning how your company is different than the others. It attracts customers- If your value proposition has clarity and precision, your customer can understand the relevance of your product which is also called value perception. Whenever a prospective customer visits your website, the value proposition is the first thing that is checked to know what service your company is offering. If the customer is satisfied with the points mentioned, the chances of his or her conversion to your brand are very high. It increases your company’s competitiveness- Most of the people search for products and services online. There are so many websites out there which sell products similar to yours. In such a case, it becomes advantageous for you to have a good value proposition to attract those prospective customers who are dissatisfied with the value propositions of other companies. It makes your brand more competitive in the market. This is especially important for small companies in order to gain greater exposure. It improves your operational efficiency- You do not need a big budget marketing strategy to explain your product to the customer. After reading your value proposition, the customer can figure out what exactly you are offering. It makes the process of conversion very quick and efficient. The company does not have to do much. It increases brand awareness – Your website’s authority increases if it has a good value proposition. People trust the brand which has a very organized and efficient website. If the customer finds all the information that he or she wants, the credibility of your brand increases and it gains popularity quickly. You need to fix your target customers and think form their perspective. You should focus on what the customer wants or what is he or she looking for. You should check how your product can solve the customer’s problem or meet his or her needs. You should know how your product gives value to your customer and what are the benefits of using it. Only then can you convince the customers to buy your product. After compiling all the information in the earlier steps, you can proceed to build your value proposition. There are a few things which you need to keep in mind while doing this. Your value proposition has to be concise and precise at the same time to make the customer understand your message quickly and easily. Long descriptions should be avoided at all costs because nobody has the time to go through so much of information. You can lose customers if your customer is dissatisfied with your value proposition. Technical jargon should not be used because the average customer cannot understand such difficult terms. If this happens they can get discouraged from going through your website and products. Your value proposition should provide a list of benefits for the customers to glance through along with the short statement of the services offered. A good value proposition can be read and understood under five seconds. You should provide add-ons like free shipping and money back guarantee to your customers. These benefits should be displayed alongside the value proposition for the customers to see. This helps in boosting your value proposition. If you follow all these steps, you are bound to get a good value proposition for your business which you can utilize to increase your customer base.